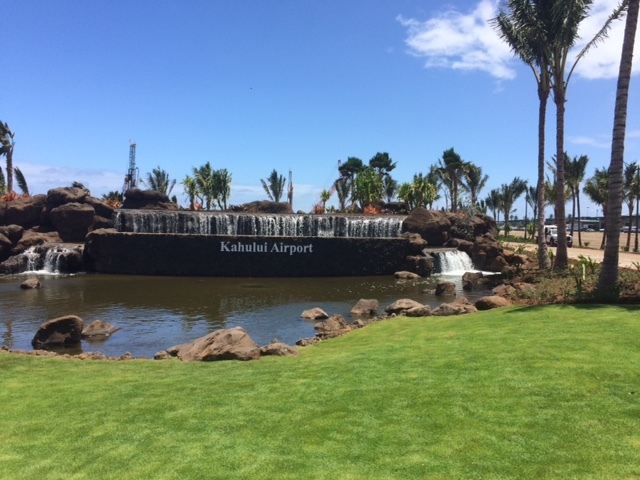 KAHULUI – The Hawaii Department of Transportation (HDOT) Airports Division celebrated the opening of the new Kahului Airport Access Road. The road officially opens to traffic at midnight Saturday, July 23, 2016. The new Airport Access Road connects Hana Highway to Lanui Loop. The improvements will help relieve traffic congestion on Dairy Road, which is the only roadway that leads to the airport from south Maui via Puunene Avenue and west Maui via Kuihelani Highway. All of this traffic travels on Dairy Road and mixes with the airport bound traffic. The new Access Road will help separate the airport users from the local community. The Airport Access Road includes a divided roadway approximately half a mile in length with two lanes in both directions, retaining walls, grade separation structures, drainage system, landscape and irrigation system, roadway signage and landscape accent lighting. Cascading waterfalls greet people as they drive to the airport terminal. The water feature elements are dual purpose, to enhance the beauty of the area and serve as an irrigation reservoir with non-potable water for landscaped areas. The reservoir contains nearly 140,000 gallons of non-potable water. Funding for the water feature was provided by the rental car customer facility charge and not state tax dollars. The reservoir also means more potable water will be available for the community. 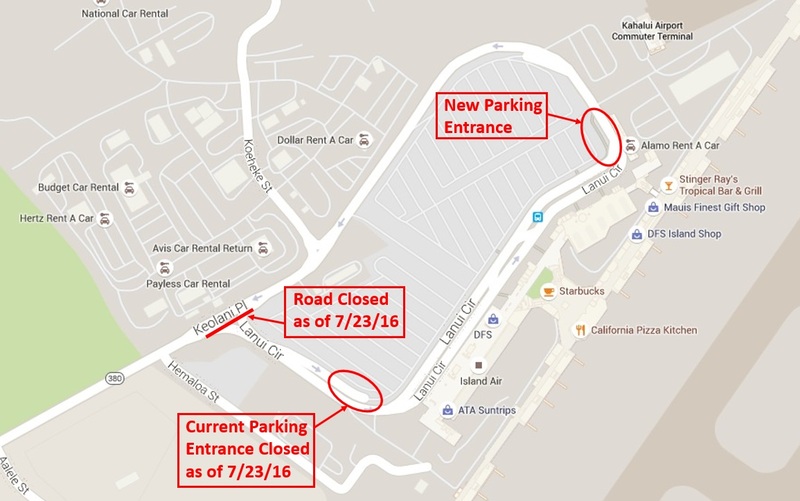 When the new Access Road opens on Saturday, the current access road from Keolani Place will close for those entering the airport. In bound traffic will be diverted down Aalele Street to the new Access Road (see map 1 attachment). The current entrance to the general public parking lot will also be closed and a new entrance located on the north side of the parking lot (across from the baggage claim) will be opened (see map 2 attachment). The construction cost is approximately $56 million, and is fully funded by the rental car customer facility charges collected by rental car companies at the airports, and not the Hawaii Department of Transportation. Kahului Airport is home to more than a dozen airlines that serve an average of nearly 8,000 passengers per day. Kahului Airport rents the most cars of all the 15 airports in the state with an average of 2,200 cars rented every day, more than twice the amount at Honolulu. 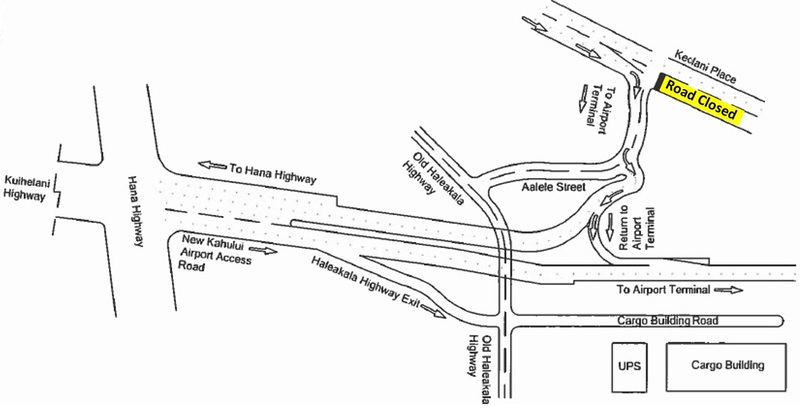 Map 1 – New Kahului Airport Access Road. Map 2 – New parking garage entrance. 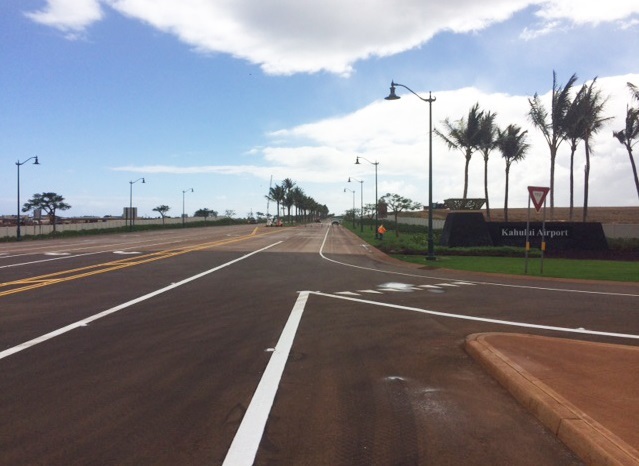 Photo of the New Kahului Airport Access Road that connects Hana Highway to Lanui Loop. Kahului Airport Access Road project includes new landscaping improvements and sign display. State officials and dignitaries untie the maile lei for the Kahului Airport Access Road blessing ceremony. 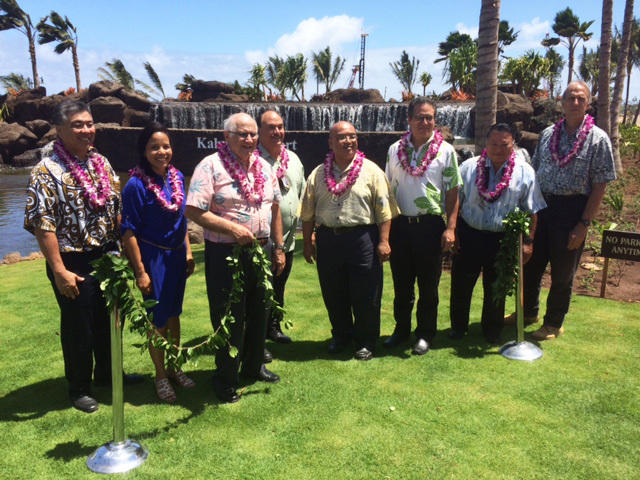 From left to right: Ross Higashi, Deputy Director, HDOT Airports Division; Leah Belmonte, Governor Ige’s Maui Representative; Joseph Souki, House of Representatives; Marvin Moniz, Maui Airports District Manager; Gilbert Keith-Agaran, State Senator; Kalani English, State Senator; Alan Arakawa, Maui County Mayor; Gerry Majkut, Hawaiian Dredging Construction Company.